Gambling operators recognised the potential of bitcoin as soon as it was introduced to the world by Satoshi Nakamoto. The crypto-currency enabled sports bettors and poker players a way to transfer value from peer-to-peer without having to rely on the traditional banking system. This has huge ramifications for sports betting in the United States where banks and credit card companies are not allowed to process gambling related payments. Thanks to bitcoin, sports punters can now deposit at their favourite sportsbook instantly and can place bets anonymously on NFL football, PGA golf, NBA basketball and every other major sport. You also don't have to pay ridiculous deposit fees to Visa and Mastercard because bitcoin banking is completely free. These bitcoin sports betting apps work on any Apple iPhone/iPad, Google Android or Windows Phone smartphone or tablet. Nitrogen Sports is the king of bitcoin-exclusive sports betting. They operate out of San Redro in Costa Rica and are generally regarded as being the premier BTC sportsbook thanks to their wide range of betting markets, responsive customer support and reputation for fairness. 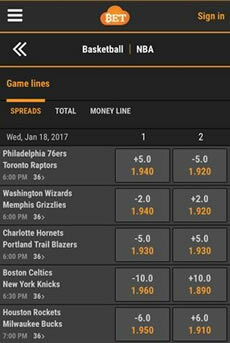 The design of both the website and mobile apps is excellent, rivalling giants like Bovada. Nitrogen Sports let you create a betting account instantly with zero personal information. Deposits are credited after 1 confirmation and payouts usually take about 15 minutes. 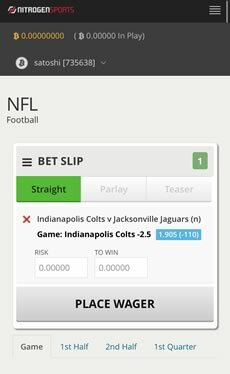 Betting starts at 0.001 BTC and goes up to 50 BTC for NFL, NBA, EPL NBA and more. In-Play betting available on American Football, NHL, Soccer and every major league. Texas Hold'em/Omaha cash games and tournaments available on iOS, Droid & Windows. CloudBet is another excellent option for sports bettors who are looking for a bookmaker that only accepts BTC. They have been running their operation out of Montenegro since 2013 and have built up a loyal following thanks to their competitive betting lines and top class software. CloudBet have developed a world class betting app for Windows Phone, iOS & Android. They are the best bitcoin bookie for in-play betting on the NFL, NBA, EPL, NHL & MLB. You can start wagering after 1 confirmtion and payouts take a couple of hours to process. The minimum wager is 0.001 BTC but they also cater for professional gamblers. Sports punters from the US are welcome and the registration process is anonymous. CloudBet are unusual in that they offer a 5 BTC deposit bonus. Most BTC books don't. DirectBet was the only crypto-currency sportsbook that accepted less popular coins like Dash, Ether, Litecoin and Monero, which made them an attractive and unique betting platform. Sadly they have now shut-down in order to focus their attention on other activities. ​Bitcoin is a currency that allows people to do as they please with their funds without being subject to nearly the volume of regulations that government-backed currencies are subject to. This is great for making purchases or deposits toward things that could be illegal in the country that a person is in, which is why online sports betting in the United States is seeing an increase in bitcoin sports betting. The biggest reason for bitcoin's boom in popularity among sports bettors outside of its ability to ease legality concerns is the speed of bitcoin transactions, which perfectly compliment the lack of government restrictions that American sports bettors see when they use their dollars to fund their accounts. Currently, only four states in the United States have legalized online sports betting. Those four states are Oregon, Montana, Delaware, and Nevada. This means that unless you live in three obscure states or the state that already has Las Vegas in it, you may face any number of obstacles using United States currency to start your online sports betting. These issues are included, but not limited to, credit card declines upon attempting to make deposits, withdrawals that simply never happen successfully because offshore sportsbooks know they can give American players with no legal recourse the run-around, and more. With bitcoin, users can anonymously deposit and withdraw and get to their Super Bowl LI betting, NBA betting, and beyond without having their experience ruined by financial horror stories. As a result of this huge difference in experience between bitcoin sports betting and betting with American currency, a large amount of bitcoin sports betting takes place in America. Unless the draconian policies regarding online sports betting in the USA are changed, don't expect the volume of bitcoin transactions from American players to change either. But there is more to bitcoin sports betting than just the freedom it affords people to avoid the litany of legal nonsense that comes with wagering American dollars. There is also a financial benefit to betting online with bitcoin. Those benefits come in the form of reduced deposit minimums and no fees associated with deposits or withdrawals. When depositing to a traditional online sportsbook, you are subjected to a deposit minimum and, on top of that, a fee that takes a chunk of your deposit, preventing you from wagering all of what you deposited. Withdrawals function the same way, with players catching a fee for different withdrawal methods, meaning that you would be catching fees as frequently as Julio Jones caught passes against the Green Bay Packers secondary in the NFC Championship Game. At bitcoin sportsbooks, meanwhile, those fees are nonexistent. Players can deposit and withdraw their funds for free at most of these bitcoin-friendly options, and with lower deposit and bet minimums, the financial flexibility of bitcoin sports betting is palpable. If more traditional online bookmakers were smart, they would match the convenience that you see with bitcoin sports betting options. Until then, expect bitcoin to continue to grow as a preferred method of funding online sports betting efforts in the United States.